Holiday Cottages on the website - please see our featured Sidmouth Holiday Accommodation below. Holiday Cottages and B&B stays situated near Sidmouth in glorious East Devon. 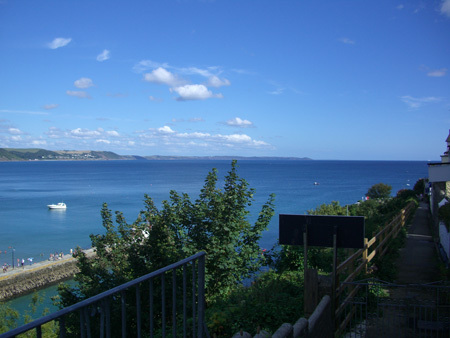 Wonderful countryside location with quality self-catering holiday accommodation including converted barns and cottages A Walker's Paradise"
East Devon's Jurassic coastline from Sidmouth, Seaton and Beer to Dorset'sLyme Regis is an ideal family holiday destination. East Devon is a perfect mix of gently rolling countryside and a stunning coastline. This region is known for the fossils particularly at Lyme Regis and Charmouth. But it is a wonderful Holiday location in its own right -the perfect place to relax and unwind. This region of East Devon is known for its tranquil scenery, and landscapes of rolling hills, pasture and ancient woodland - with many parts being designated as Areas of Outstanding Natural Beauty. We list many Holiday Cottages and Self-catering holiday Apartments and Caravan breaks in the Sidmouth, Seaton and Beer , Lyme Regis and Charmouth area, that will provide the perfect location from which to enjoy and explore the sights and sounds that Devon has to offer. Holiday Cottage and B&Bs near Sidmouth are ideally situated to explore and enjoy the enormous variety of coastal and country attractions in the area. Our Self catering accommodation near to Sidmouth are ideal for families who need the flexibility that a self-catering break can offer, allowing you to enjoy your holiday break at a pace that suites you. The coastline offers clean beaches and stunning cliffs stretching from Exmouth's two and half mile sandy beach through Budleigh Salterton to the Regency splendour of Sidmouth ( with the towns hotels and promenade featuring in many historic dramas, such as Jeeves and Wooster) to the quaint fishing village of Beer along to Seaton and historic coastal resort of Lyme Regis in West Dorset. The historic market town of Honiton and cathedral city of Exeter are also both within easy reach, as are many National Trust attractions. Self catering holidays in Devon give you easy access to Devon's attractions, coastline and countryside. Self-catering Holidays give you the freedom to choose the pace of your Holiday. This area of East Devon has many coastal attractions, from Charmouth and Lyme Regis in Dorset in The East, through to 'Regency' Sidmouth and the picturesque Seaton and beer in the centre of the region. The whole area is a walker's paradise with limitless coastal and country paths all around. In addition there are opportunities for golf, swimming, water sports, sea and coarse fishing, cycling, bird watching and fossil hunting. Holiday Cottage sleeping 5 - located in the popular holiday town of Sidmouth, South East Devon. An ideal location for exploring all that South Devon has to offer. Sidmouth was described by Poet Laureate, Sir John Betjeman, as A feast of visual delight and there are certainly many beautiful sights to see. Sidmouth is a beautiful, unspoilt regency town overlooking the waters of Lyme Bay. Sidmouth has effectively managed to preserve its old world charm - without the intrusion of modern buildings, which clutter the promenades and seafronts of so many of our traditional seaside towns. Situated on the second floor of a beautiful period stone building, you can relax in this stylish apartment, whilst being just minutes away from the many restaurants, art galleries, shops and pubs. And just a 3-4 minute stroll to the beach.